How about you? What are you planning for Spring? This post brought me right back to when we lived up north. By the time Feb rolled around, I had already had enough of winter, grey skies, cold and snow. Like you, I could pour over those seed catalogs forever. Bulbs were my obsession, tulips, jonquils. I loved them all. Now that we live in Fl and have this crummy sandy type soil, we no longer have a garden. I miss it! Have fun dreaming of all the fun things you will be doing outside very soon. I didn't know about Florida and its crummy soil and that you couldn't garden there. Bummer. We've had such a cold winter in Texas, I've basically got a clean slate to work with. Well, I will when it gets warm enough to clean up the beds. I've got an herb garden near the house and I'll be planting cilantro, tarragon, parsley, and catnip. I think the basil and dill will come up on it's own. That stuff wanted to take up the whole yard last year, but made for great smells when mowing! I don't know about flowers just yet, it will depend on what the nurseries are offering. I MIGHT try to seed some areas, but I say that every year and don't get to it til too late. I am hoping for 2-3 varieties of tomatoes, jalepeno, serano, and bell peppers. I tried one of the hanging tomato bags last year and the ones on the ground did better. Eggplant and zucchini are my "try-outs" this year. I love to garden and planning it is half the fun. if I could guarantee that I wouldn't KILL all that I planted, I'd think about a garden. I'd love to have one someday, just no time or space for one now. Potatoes. That was my single most successful planting from last year--we have lousy sandy soil here, but the potatoes seem to like it. And I've been composting like a fiend for the past year, so maybe I can enrich the soil? The slugs ate my zucchini last year. I haven't had time to do a garden since we've lived at this house, but I do want to grow some herbs in my window. Basil is my favorite. Our soil here in central VA has a lot of clay or something and has horrible drainage. With all the snow and rain we've gotten, our yard just has puddles sitting everywhere. It did this last year in June as well. We have to figure out the secret to the soil before we can do anything! I'm going to try container gardening this year. Because our house backs up to a wooded area, we don't get enough sun for a nice garden, but our deck does. I sure miss my homegrown tomatoes. I hope the containers work! Your post really gets me revved up for spring, Deb. I started composting early last summer and I'm totally addicted. I can't throw away a single onion peel or egg shell. I constructed chicken wire cages, dump it all in there, and mix in leaves from the woods around my house (and the piles from fall raking). I had my first dark rich batch in the fall and am looking forward to more soon. Wish we had a photo area where we could share gardening photos. Wouldn't that be fun! I wish I had the ability, patience and SPACE to grow a flower and vegetable garden. Unfortunately, I have none of the above so I enjoy others gardens. And visit the local farmers markets. We usually try to have a small vegetable garden each year - corn, tomatoes, squash, okra, field peas, and sometimes green beans. This year I hope to add some lettuce. 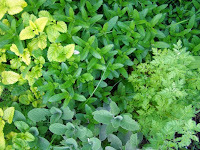 I also try to grow some herbs, but usually in containers - rosemary, lavender, basil, oregano, sage and lemongrass. If only spring would get here now. Chris, that's the Great Sunflower Project. I did it last year and was even written up in the Milwaukee Journal for my efforts. They want you to use a certain sunflower, so the results are true and they will even send you seeds. Check the website to find out more. If you've got a garden, you gotta have Kentucky pole beans (green beans). Pretty easy to deal with usually. Also okra if you like to eat it; I don't, but it's pretty easy to grow. That Florida soil is a pain to work with, but it can be done. Lots and lots of compost helps, or have a container garden. One thing that will not grow there is rhubarb; it's just way too hot for it. I'm just a bit too lazy to deal with a garden. I want to, but after a few weeks I get tired of fooling with it and everything just pretty well dies. Good luck to everyone else, though! Oh, Mason, I so miss fresh Okra. My dad had this huge huge garden every year (we lived in Texas, long growing season). Now I'm in Illinois, and while I can buy fresh corn until frost, nearly, the growing season here isn't long enough or hot enough for okra to do well. I tried a container garden year before last and my tomatoes did ok, but the squash started putting on right before frost...This spring I have two rough semesters at school back to back scheduled. So all I'll probably have time for is tomato pots. I was thinking about topsy turvy planter and they have a strawberry one. I live in an apartment but I'd love to grown carrots, green beans, and potatoes. No place to do it. Do you get the White Flower Farm catalogue? Oh my! I love that thing. I think they have a web site as well. I do now! Thanks for the tip. Living in a city,I'm a little wary about the safety of the soil so I did large container gardens with cages last year on a small porch off the kitchen. It's a spot that gets sun all day. I grew small cukes,yellow and red tomatoes, peppers, and lots of herbs. The oregano is still going strong in a sunny window in the kitchen! I like signlady's idea of pole beans and may try okra too.